A lone horseman, carrying the flag of the great state of Texas appears atop a 600 foot cliff, signaling the beginning of the most spectacular outdoor musical drama in the world. Suddenly, a cast of more than 60 actors, singers and dancers takes the stage to kick off the show that millions of fans from all around the world have come to see. 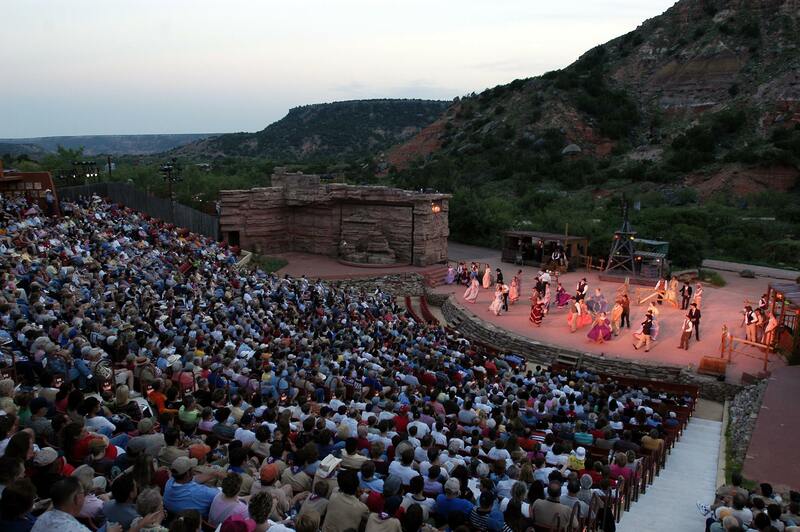 The theatre is located in the second largest canyon in the USA, Palo Duro Canyon State Park. Set against an authentic tapestry of history, the show’s fictional characters bring to life the stories, struggles and triumphs of the settlers of the Texas Panhandle in the 1800s. Song and dance abound with a generous helping of good ol’ Texas humor, fascinating lighting, special fire and water effects, including the Dancing Waters of TEXAS and fireworks. You’ll want to come early and enjoy a delicious old fashioned Chuck Wagon BBQ Dinner on our covered patio.